With a one-man show booked at the Eagle Gallery for September 2015, I had been planning my exhibition for a while but needed to put brush to canvas, the time had come. The title of the exhibition would be “Urban and Rural” and I had got as far as deciding the need for 20 pieces 10 urban themed and 10 rural themed on opposite walls of the gallery. Also, I had decided on canvases measuring 50cm x 70cm deep edged all to be landscape orientated. The next stage was to go through my photo collection to find appropriate pieces. This entailed over selecting so that I could edit down to the best 10 of each subject. I found I had a tendency toward interesting skys (both categories) and roadwork’s (urban) – so some of these had to go. The final images were then cropped to shape and placed next to one another on a computer-generated elevation of the gallery walls. Exhibition complete! – except from the actual painting part. A short while after this process, I returned to the folder “Rural 1” on my computer to see which predetermined image needed producing. I knew with the time left before the show, I would have to be quick with the painting as though painting live in the wild. 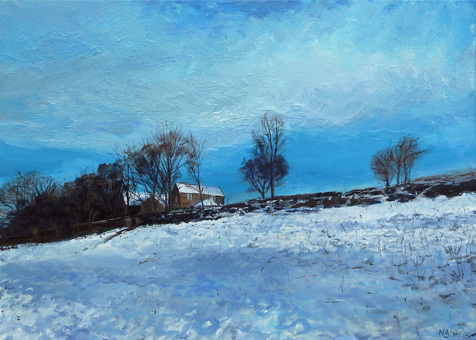 As the prototype piece, “Winter in Belper” fell into place fairly well. I did however use an overall coat of paint (a blue in this instance) which I later dropped from subsequent works in the series. The composition worked well with a couple of sessions detailing the sky and the snow, with the horizon trees being added last. On completion, I felt that a frame was needed to contain the work – so I ordered up a batch of tray frames so that all the pictures could be framed, giving each work “equal billing”. Once the first seven were complete they were all framed and the style for the exhibition was generated.